NETWORK FINALS: There were no adjustments from Monday’s preliminary ratings. CABLE HIGHLIGHTS: TNT’s Golden State vs. Cleveland NBA game dominated Monday cable at 1.86, with the late Houston vs. Clippers game at 0.86, and the afternoon Lakers vs. Memphis game at 0.43. USA’s WWE telecast was at 1.12/1.08/0.96, compared to last week’s 0.97/0.91/0.82. VH1’s LOVE & HIP-HOP fell 0.11 to 0.85. Discovery’s STREET OUTLAWS’ 9PM episode returned at 0.77, and the 10PM episode was up 0.21 to 0.54. 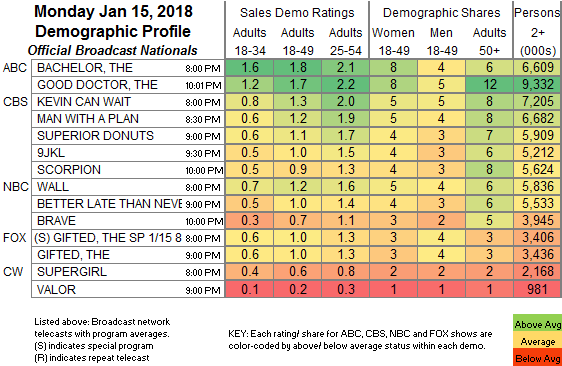 Note that MTV listed TEEN MOM and SIESTA KEY as reruns, so they’re not on the chart, but that was clearly a mistake, since TEEN MOM was up 0.13 to 0.74/1.3M and SIESTA KEY was at 0.31/612K E! aired an off-night KEEPING UP WITH THE KARDASHIANS at 0.69, and REVENGE BODY followed at 0.33. Bravo’s VANDERPUMP RULES ticked down to 0.61, and RELATIONSHEP held at 0.24. ID’s JODI ARIAS: AN AMERICAN MURDER MYSTERY remained strong at 0.59, and PEOPLE MAGAZINE INVESTIGATES was steady at 0.32. ESPN’s COLLEGE BASKETBALL doubleheader was at 0.51/0.41. 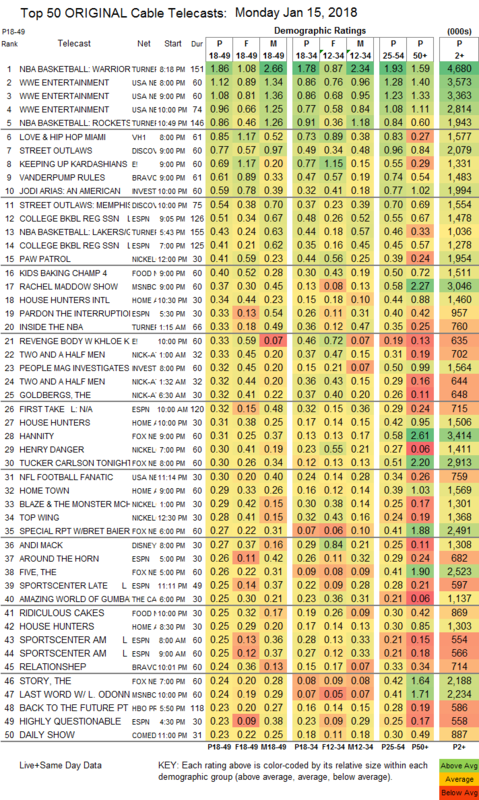 Nickelodeon’s noon PAW PATROL hit the Top 15 at 0.41. On Food Network, KIDS BAKING CHAMPIONSHIP rose 0.06 to 0.40, RIDICULOUS CAKES was down 0.02 to 0.25, and VEGAS CAKES ticked down to 0.19. MSNBC’s RACHEL MADDOW SHOW continued its lead of cable news at 0.37/0.58/3M, over Fox News’s HANNITY at 0.31/0.58/3.4M and CNN’s ANDERSON COOPER 360 at 0.23/0.33/1.2M. On HGTV, HOUSE HUNTERS INTL rose 0.11 to 0.34, HOUSE HUNTERS was at 0.31/0.25 compared to last week’s 0.27/0.27, and HOME TOWN was up 0.04 to 0.29. BET’s NAACP IMAGE AWARDS was at 0.17.